When it comes to technology, it wouldn’t be wrong to say that the U.S. has a clear superiority to the rest of the world. Although many devices in use today are manufactured in China, the original manufacturer of the devices and the owner of many patents are U.S. companies. 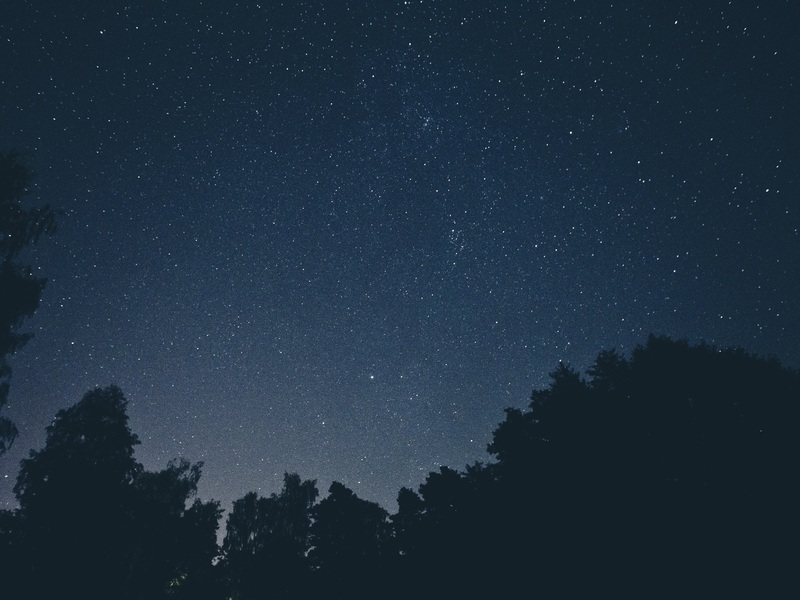 However, the beginning of the Post-PC era caused a great change in the market (and demands) and both mobile devices and mobile applications have started to come to gain prominence. With the expansion of mobile technology, the U.S. appears to be losing it’s leadership in this area. 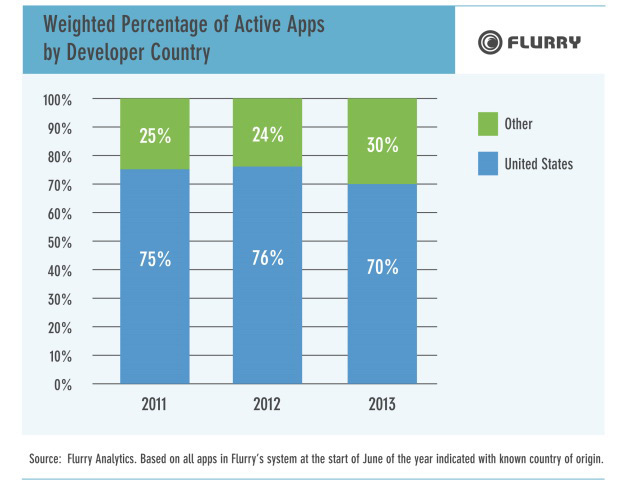 According to recent research, the majority of mobile applications are being developed outside of the U.S.
Flurry’s survey shows us this situation is not new. In 2011, 45% of applications were developed in the U.S., and the other 55% were developed elsewhere. Despite the continuation of this trend in 2012, the dominance of the U.S. has weakened further this year, recent figures show that only 36% of applications were developed there. Although this is still a significant proportion, the pace of change between years is significant. The rest of the world is developing more and more applications, more then twice as much as the U.S. Although the application development rate has dropped in the U.S., they still have the majority of the engagement percentage of actively-used applications. The data supports the fact that a big portion of the mobile applications which used daily are owned by the biggest firms in the U.S. That makes sense given the size of the U.S. population, the fact that it was an app pioneer country, and the number of English speakers in other countries who might be able to use U.S. made apps without any localization. According to Flurry, nearly 60% of the time U.S. users spend using applications is spent on ones developed domestically, meaning that more than 40% of the application time of U.S. consumers is spent using applications developed in other countries. While U.S. made applications are used elsewhere, unsurprisingly, people in other countries spend a significant amount of their time using apps developed locally. 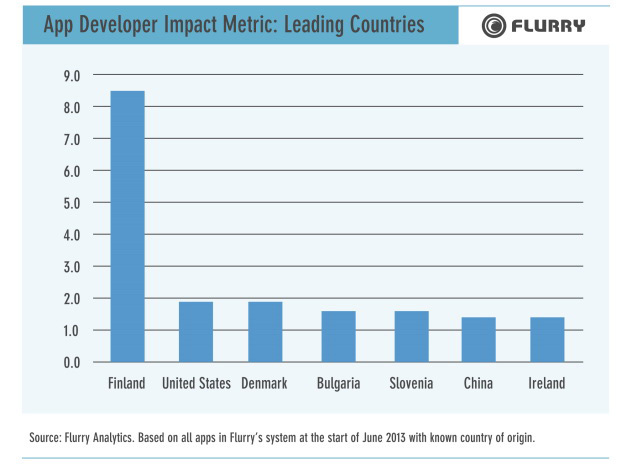 Flurry has also prepared a graphic to reveal which countries are most successful creating global or localizable apps. 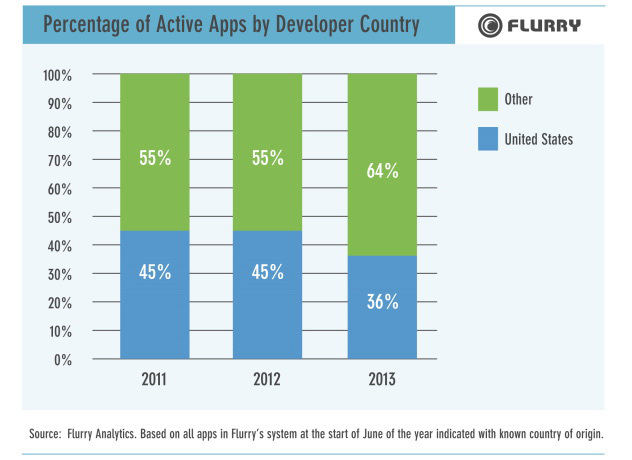 The numbers in the chart below reflect the impact of application developers in a given country. 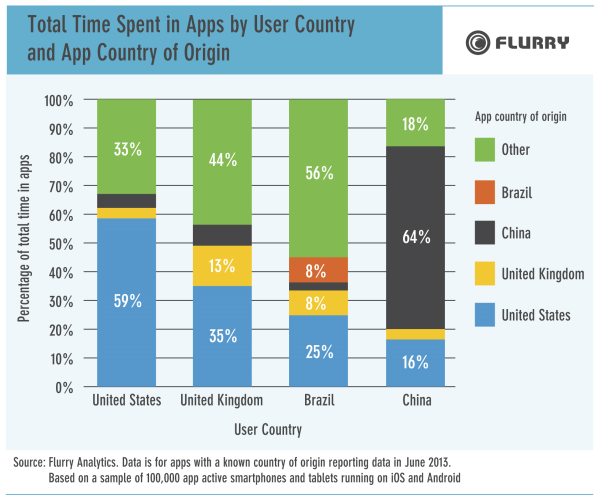 It takes the total percentage of time users worldwide spend in applications developed in a country and divides it by the total percentage of apps developed there. However, in this table, the U.S. is not the first country, it is far behind Finland which has about 8.5 points. The U.S. is second, followed by Denmark, Bulgaria, Slovenia, China and Ireland respectively. Despite the increasing number of the mobile start-ups across the country, unfortunately, New Zealand is not among those top seven countries. We’ve recently created a report on facts and figures about mobile technology and usage in New Zealand. Click here to download the report. Do you think New Zealand can be a leading country on mobile technologies in the foreseeable future? We would like to hear your opinions!